Grooming a Persian cat is quite different than grooming other cat breeds. Persian cats need grooming on a daily basis, at least as far as combing goes. We use a wide-metal tooth, static free, comb. We do not use a brush; unless it is for "fluffing" the coat of the cat after all mats have been removed. Of course, if combing your Persian is part of your daily grooming, your Persian cat will not have any mats. Pay special attention to behind the Persian's ears, under the armpits, and around the rump and legs as mats collect faster in these areas. Here is a link to our recommended Supply List for Persians. Before you bathe your Persian, make sure you get all the mats out. To do this, take a wide toothed comb, and gently comb out the cat. Do NOT pull the mats out. If you come across a mat, gently pull (break) it apart using your fingers. If you pull the mat out with your comb, you will pull all the hair out right down to the skin and have a bald patch on your Persian. Worst case scenario, if the mats will not break up, you can use a dematting tool or use a seam ripper (a tool used by people that sew). Again, whatever you do, please do not pull the mat out as it will not only ruin the coat, but cause a lot of pain to your Persian cat. The frequency of baths will depend on your Persian's fur. A Persian cat will begin to look greasy as it becomes dirtier and mats will increase quickly if the cat is not bathed. A clean Persian's coat is not greasy and will not appear separated. An owner can either bathe their Persian themselves or take it to a professional groomer. However, the type of bath and the products used are important, so if you opt to use a groomer make sure you know what products are being used on your cat. Remove all mats and knots in your cat's coat before the bath. Trim the cat's nails prior to bathing. Please visit the Amazon.com web site to order these products. I use my kitchen sink to degrease and bathe my Persians. The first step in a proper bath for a Persian is to degrease it. After all the mats are removed, it is time to degrease the coat prior to bathing. There are a few products that I recommend: Goop, PinkPawPal Degreasing Shampoo, and/or Dawn dishwashing detergent. If using Goop, apply it directly to the dry coat and rub it in, paying attention to behind the ears and underarm areas where the coat is usually the greasiest. It is not unusual to use a whole container on one adult cat. Goop is great in the fact that it not only degreases, but cleans and moisturizes (AGAIN: I need to stress this: Goop is applied to a dry coat). You can purchase Goop at Wal-Mart (or similar type stores) in the automotive section. It comes in a white tub just make sure you buy the NON pumice kind. If using PinkPawPal Degreasing Shampoo, please follow the directions. Pelaqita Persians uses and recommends the PinkPawPal professional grooming products. If using Dawn, there are a couple of ways to use it and it depends on what you feel most comfortable with. Some people apply the detergent directly to a wet coat while others prefer to dilute it. You can fill the sink with warm, soapy water (Dawn). Put the cat in the sink and work the soapy water into the cat's coat until thoroughly coated. Wash thoroughly. Do NOT use Dawn on a weekly basis as it will dry out the coat and strip color from it. Whether using Dawn, Goop PinkPawPal Degreasing Shampoo, after degreasing the coat it is important to rinse thoroughly. If using Goop, after applying to dry coat, add a small amount of water and lather the goop on the cat. Rinse thoroughly. After degreasing your Persian's coat, rinse thoroughly. Float your cat's coat (pictured to the right - see how the cat's coat is "floating" in the water?). Floating your Persian's coat is to gently ease the cat under the water (not its head) so that the coat rises up. Let the cat up immediately. Do this several times to make sure the water gets under the coat. After using the Goop to degrease the cat, and rinsing thoroughly, then it is time for the first shampoo. For our bi-colors, we use PinkPawPal Whitening Shampoo to wash the cat for the first shampoo. If I am bathing any color that is not a calico or bi-color (meaning it has white on it), I use the PinkPawPal Degreasing Shampoo as the second step. Lather the cat up using lots of water. Do not use too much soap or it will be difficult to remove all the soap from the cat's fur. Rinse thoroughly again. It is important to make sure you get all the shampoo and any residual degreaser out of the coat. Float the coat again. Rinse thoroughly again. It is important to make sure you get all the shampoo out of the coat. Float the coat again. If you fail to rinse all of the shampoo out, the coat will appear dirty and greasy within a few days. If you want, now is the time to use a shampoo that is formulated for the color of your Persian. 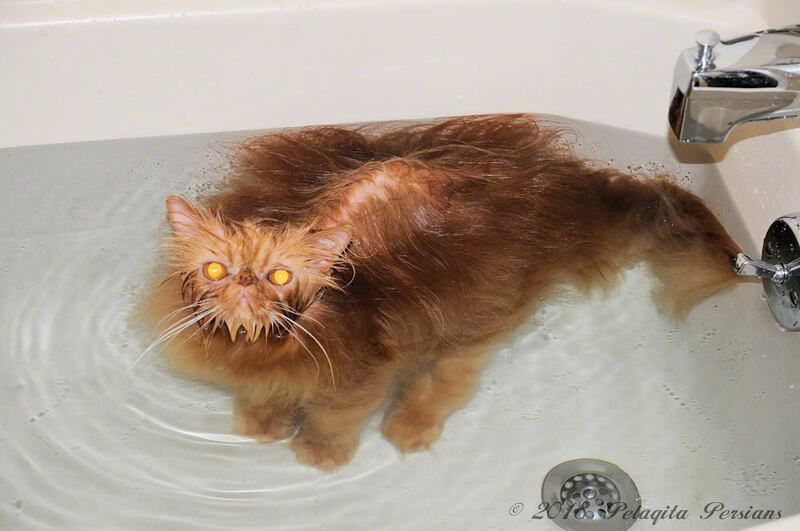 Some breeders and show people will sometimes use a water/apple cider vinegar mixture after this rinse to help restore the cat's natural PH. Add 2 tablespoons of Apple Cider Vinegar to a cup or so of water, pour this thoroughly through the coat and then RINSE the coat with warm clear water AGAIN. Pelaqita Persians uses and recommends using the PinkPawPal Balancing Rinsing Solution. To add back moisture/oil to a stripped coat use a medicated shampoo or a cool, hot-oil treatment. I say cool, hot-oil because you do not want it so hot that you burn the cat's skin. You will need to experiment with different shampoos and products to see what works best on your Persian's coat and if it needs a moisturizer or not. I like the Medicated Oatmeal Shampoo by EZ-Groom. However, I am now solely using the products from the PinkPawPal line of professional grooming products. They have a rich conditioner that I use all the time, Super Soft and Nourishing Conditioner. If you use a hot-oil treatment on the cat, you will then need to wash it out and rinse again. Prior to a final rinse you want to make sure that there is no soap in the cat's eyes. Flush or rinse the eyes with an approved eyewash such as Opticlear which can be found in most breeder catalogs and online websites such as Amazon. Purchase Opticlear on-line from Amazon.com. WARNING: Do not use anything in your cat's eyes that says it gets the red out. Rinse your Persian one last time. Make sure the water runs clear and pay special attention to the underarms and stomach. If there is any shampoo left on the coat at all, the coat will appear flat and greasy looking within a very short time. Float the coat again. If any bubbles raise up, then there is still soap or conditioner on the coat. Rinse again. Squeeze the excess water from the coat, pat the coat dry with a towel, dry the cat's face with a towel, and then dry the cat with a dryer. 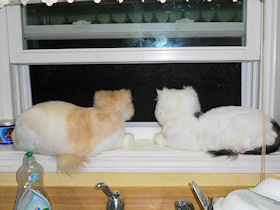 There are a few ways to dry a Persian cat: cage dryer, or by blowing dry with an animal dryer (not your hair dryer). I use both. However, it is important that whatever you use to dry your Persian that you do not burn him. I prefer the Flying Pig dryers as they blow the water off the coat and it has two or three adjustments for the heat (depends on the model). It is not necessary to comb out the coat until the hair is almost dry. Flying Pig Pet Dryer via Amazon.com They are a fairly comparable when compared to the Metro Force dryers, but they last forever and therefore, it is a good investment. Wash your Persian's ears after degreasing, but before the shampoo. There are commercial products designed for this. Petkin Ear Wipes are handy for cleaning ears (available online at Amazon). To remove static from your Persian's coat, you can mix a small amount of fabric softener in a gallon of water. Pour it through the coat, spreading it thoroughly and then RINSE AGAIN! After you have washed your Persian cat a few times, you will be able to tell if you need to remove static from his coat and will need to use the fabric softener/water mixture or not. Never flea bath or flea dip a kitten! Different coat colors will require a different bath shampoo. For example, for a white coat there are shampoos specially designed with a brightening or bluing formula to whiten the coat. There are shampoos formulated for black coats. There are shampoos formulated for red coats. So when shopping for a shampoo keep in mind the coat color of your Persian. Most of the commercial shampoo products will specify exactly what they are intended to do. Shop around. There are some good suggestions for these shampoos on our Supply List. Some people do not like the grooming that some Persians need and opt to shave their cats into a "lion cut". A lion cut is where the body is shaved and the tip of the tail, legs and head remain unshaven. It is really a cute cut. Of course, if you are showing your Persian cat, you cannot show a Persian with its coat all shaved off. If shaving is needed, contact a groomer or your vet. Powder can help absorb some of the grease. I suggest using soft white grooming powder between baths. Now you are an expert on bathing and grooming your Persian cat. Make it an enjoyable activity by being extremely patience with your cat. Many Persians learn to love their baths, some merely tolerate it. However, the more you bathe your Persian, the more he will get used to it. Our suggestions for supplies, toys, etc. to get for your cat. More information on bathing and grooming Persians. This article offers written information as well as a couple of videos on grooming and bathing Persian cats.